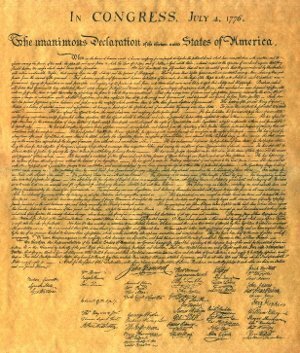 Over two hundred years ago, Thomas Jefferson penned the Declaration of Independence, kicking off the American revolution and the creation of the most exceptional nation in the history of mankind. Today we look back at that nation as it once existed and mourn what it has become — what we have let it become. In the Declaration of Independence, Jefferson documented the complaints against the King of Britain which made American independence necessary and good. I cannot imagine a more apt description of the hordes of bureaucrat who make a living from harassing the American people and squandering their wealth. Our ancestors threw off one despot only to have their children replace that one despot with tends of thousands of tiny despots. King George was one man and far away. His ability to create damage was limited by his time and attention, and also by the great distances involved and the limited communication technologies available at the time. Our current masters are far more organized and modern technologies enable them to easily harass the American people without stepping away from their desks. Thomas Jefferson wrote “Experience hath shewn, that even under the best forms [of government] those entrusted with power have, in time, and by slow operations, perverted it into tyranny.” Time has proven Mr. Jefferson to be painfully correct. Now is the time for a new Declaration of Independence — independence from the monstrous machine of government which we have erected over us. We must free ourselves from the oppression of this mechanical beast, this steel leviathan. This is a decision each person much make for him or herself — the decision to set ourselves at odds with our oppressors — to cease being willing slaves and obsequious subjects and to instead take our natural place as free individuals. We do not demand this right, we already own it — and we will defend it with every available means.